We have now completed the restoration of 650 headstones knocked over by the Nazis in the mid 1940's. We are going back in the summer of 2018 to continue our work. This trip will include young Israelis and folks from the German AFS program. We need your help yet again to fund the heavy equipment rental, food for the volunteers, transportation and lodging. Please consider funding this important venture. We have a proven track record of success and ask for your financial support. Here is more important information on our past achievements. Jewish settlement in the Bialystok, Poland area dates back to about 1658. Bialystok grew to be a successful and predominantly Jewish community. For hundreds of years before 1906, the Jewish community flourished in the Bialystok area. By many accounts, Bialystok was the quintessential example of Polish-Jewish assimilation and acceptance in society. Unfortunately, the city suffered from anti-Semitism even before the Nazi desecration which gave rise to this funding request. In 1906, the Czarists massacred many of Bialystok’s Jews. A black obelisk monument to the victims of those programs stands prominently in the center of Bagnowka cemetery. After the pogroms but before WWII, Bialystok was once again a vibrant Jewish community. World War II changed Bialystok forever. After the Nazis invaded Poland in 1939, they killed approx. 2,000 Bialystok Jews in the Great Synagogue Fire of June 27, 1941. Most of my wife's maternal grandfather’s family perished in that inferno. The remaining Jewish population was forced into a ghetto by the occupying Nazis. Many of those Jews were killed during the 1943 Bialystok ghetto uprising. Those who remained were taken by rail to the Treblinka death camp, where the average life span of a prisoner once he or she stepped foot onto the platform was about two hours. In June of 1943, the Nazis entered Bagnowka Cemetery with heavy equipment in order to wipe out any remaining traces of the Jewish community in Bialystok. Working over a period of several weeks, the Nazis destroyed, knocked over, and dismantled thousands of headstones and monuments. Monument bases, blocks, obelisks, and pediments were scattered about and mixed up. Upon our visit to Bagnowka in 2015, my wife Amy and I were devastated when we saw the extent of the desecration and destruction at Bagnowka Cemetery. 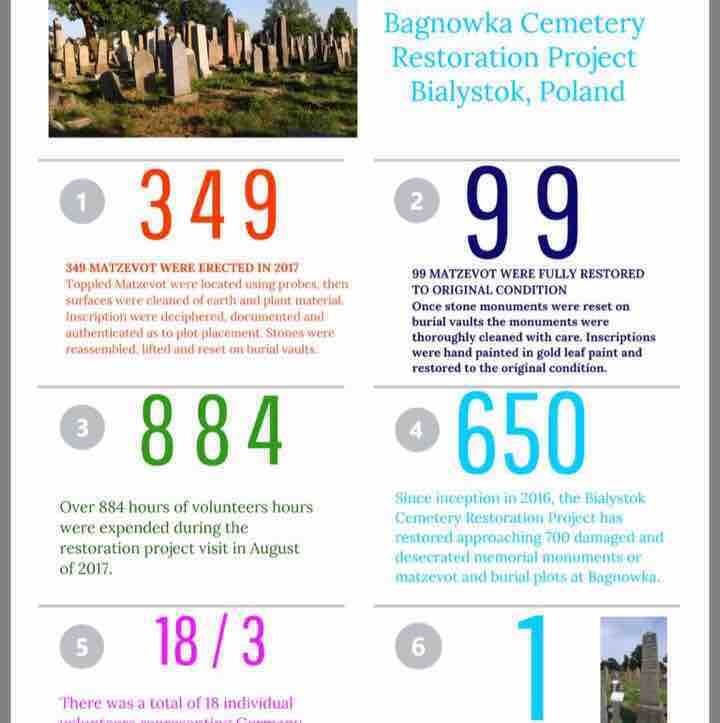 During our first visit to Bagnowka in 2015, I came up with the idea of using my skill sets to help restore the cemetery. I have over 35 years’ experience working with stone, stonescapes, heavy equipment, planning, and operations. Although an earlier restoration effort had been undertaken, those workers only had hand equipment and a tripod pulley system available to lift the stones, some of which weigh over 4,000 pounds. The prior project team was able to lift and reset only 2 or 3 of these headstones per day. During our trip to Bagnowka in August of 2016 and 2017 I operated the heavy equipment we rented locally for the job. With the help of 6 laborers, we strapped, lifted, and otherwise re-assembled the monuments and obelisks. By the end of the week, working 6 consecutive 10 hour days, we reset, restored, and re-dedicated 301 monuments during 2016 and another 349 in the summer of 2017 thus providing a measure of dignity and peace to the souls whose earthly remains were interred at Bagnowka. Considering that the Bagnowka Cemetery originally contained approximately 30,000-35,000 graves, our work was a humble but nevertheless significant and tangible effort. Our work could not have been successful were it not for important preparatory work by others. Back in 2009, a team of local Polish folks working with others from all over Europe began restoring this cemetery. The initial restoration idea and thrust of this project was the brainchild of one of the last living Bialystok Jews, Lucy Lisowska. Lucy engaged a renowned Judaic academic in the US by the name of Heidi Szpek. Heidi is a PhD. professor emeritus from Central Washington State University. Heidi translated the Hebrew/Polish/Russian inscriptions, provided critical cultural context and linguistic skills needed to understand grave orientation and placement, and oversaw the proper placement of stones or monuments onto the correct grave. We are seeking to involve as many people in helping to #RIGHTING A WRONG. Phase Three of this project will occur during the summer of 2018. We would like to obtain the funding needed to reset or upright another 400 headstones! As with our successful of our two previous GO FUND ME Campaigns funds donated to this effort will offset equipment purchases, travel, food, housing for our team of unpaid volunteers, and the cost of renting heavy equipment. In addition to resetting fallen but unbroken headstones, we plan to work with European volunteers who will repair broken stones so they can be reset in the future. Please help us to fund the important work of restoring the dignity of Bagnowka cemetery. Please help right the wrongs and atrocities of the past. If you have any questions or if you need more information, please contact me at josh@joshdegen.com . All of us on the team are honored and pleased at the prospect of continuing our work at Bagnowka Cemetery- with your help, we will get there yet again in 2018! Speaking for the entire Bialystok cemetery restoration crew- Amy, Alan, Daniel, Jan, Josh, Heidi, Howie, Allie, Lucy, Paula, Pete, Andre, Lucas, Waldek and many others - we feel that it is vitally important for us to continue our work. Our work to restore and re-set monuments and headstones at Bagnowka will bring a measure of peace to the dead and it will right a wrong inflicted on humanity by the Nazis. Our work will help restore the dignity of this final resting place. Finally, and as importantly, we will ensure to the best of our ability that the Nazis’ plan to wipeout any traces of Jewish life and culture in Bialystok will be thwarted, forever. The memory of every grave we restored lives in all of us. THESE SOULS ARE REMEMBERED – THEY ARE NOT FORGOTTON! Thank you in advance for your generous support of our project. Pass the word! Thank you to everyone that has donated to our project. If you would kindly consider another contribution please do not use this campaign. Instead use the new one called Bialystok Cemetery Restoration 2019. Thank you. We wrapped up this year's work at Bagnowka cemetery. We reerected another 314 fallen headstones restoring dignity to those interned at this solemn site. Our three year total stands at almost 1000 now. We want to thank our donors who made this effort possible. We also thank our many volunteers including Lucy, Heidi, Frank, Waldek, Andre, Kuba, Lucas, Daniel, Xan, Ali, Paula, Karen, Iva, Pete, Howie, Nathan, Darren, Peter, Barry, Michele, Ofer, A.S.F. and my wonderful daughter Alia and awesome wife Amy. We could not have achieved the great successes without each and everyone of these hardworking volunteers. We hope that we did not forget anyone and if so thank you too! Thanks again and we look forward to 2019. We are about a month away from this year’s trip. We have identified over 300 more headstones to reset. This year we will have over 40 volunteers participating to continue this restoration of Bagnowka. A group of ASF folks from Germany will join us along with a group of Israelis. In addition to resetting more headstones other groups will clean and paint the stones that have already been reset. Our fundraising goal is very short and we kindly ask for your donations to help this important cause.